A newly released U.S. congressional study says that China, Russia, Iran, and North Korea are developing powerful weapons that won’t kill people directly but can cripple critical life-sustaining infrastructure and cause mass populations to eventually die out. The study, titled “Nuclear EMP Attack Scenarios and Combined-arms Cyber Warfare” was written in July 2017 by Dr. Peter Vincent Pry, an expert on national and homeland security and director of the U.S. Nuclear Strategy Forum, a congressional advisory board. It was only cleared for public release by the U.S. Department of Defense in July 2018. Last week, the report was published for the first time, as reported by the Washington Free Beacon. Any nuclear weapon can generate electromagnetic pulses (EMP). But EMP bombs, sometimes referred to as sixth-generation weapons, can generate strong gamma rays and other radiation that spread very quickly. The radiation interacts with the oxygen and nitrogen atoms in the air to generate an extremely strong electromagnetic pulse. These pulses can damage all electrical and electronic equipment within the radius of the bomb. Meanwhile, a super-EMP bomb, also known as a nuclear EMP, causes a nuclear explosion through electromagnetic radiation, the study noted. The effects from an EMP bomb are dangerous within its entire field. This is why a scenario in which such weapons are deployed is referred to by U.S. analysts as “blackout warfare,” according to the congressional study. In addition, accuracy isn’t necessary in order to drop an EMP bomb, as the field coverage is so vast. An EMP bomb detonated at 30 kilometers (about 19 miles) has a radius on the ground of about 600 kilometers (about 373 miles). When the device detonates at 400 kilometers (about 248 miles), the radius reaches 2,200 kilometers (about 1367 miles), which is large enough to span an area from New York City to San Francisco. After the EMP bomb is detonated, it will generate a potentially catastrophic effect, damaging electric grids, computing systems, and electronic systems—including those used by the military and critical infrastructures such as telecom networks, fuel pipelines, banks, and sanitation systems. With electronic systems down, EMP-induced industrial accidents can spark explosions and widespread fires. When chemical plants explode, the toxic clouds generated would pollute the air, water, and earth. In addition, nuclear power reactors would run out of emergency power within days and explode, spreading radioactive plumes to nearby areas, the study predicted. Without clean air and water supplies, people would not be able to survive after a period of time. The study described hypothetical scenarios in which nuclear aggressors would deploy EMP bombs: Russia striking Europe; China targeting Taiwan; Iran targeting the Middle East, and North Korea targeting Japan. The study also played out scenarios in which these four countries would attack North America. To attack North America, these countries could use a wide range of methods to launch an EMP bomb: “satellite, a long-range missile, a medium- or short-range missile launched off a freighter, some kinds of cruise missiles and anti-ship missiles, a jet fighter or some kinds of jet airliner doing a zoom climb, even a meteorological balloon,” the study said. 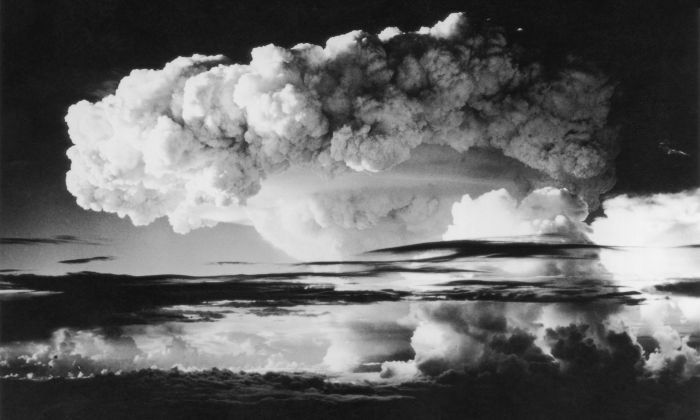 The study noted that “totalitarian and authoritarian” authorities are building super-EMP bombs now, but didn’t give an estimated timeline for completion of the weapons.